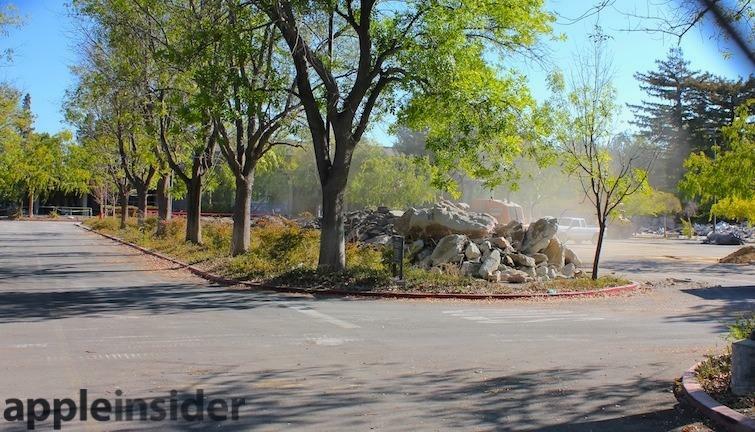 Apple is clearing a landing path for its new "spaceship" Campus 2 in Cupertino, Calif. 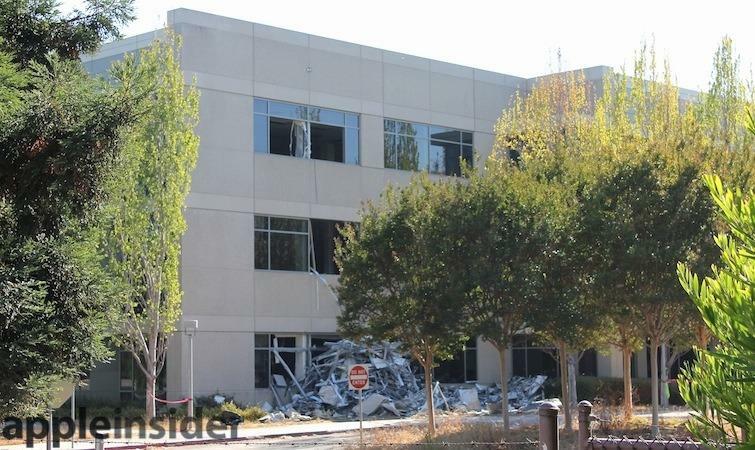 The first work has begun, involving a salvage and destroy operation targeting sprawling structures on the former Hewlett Packard Pruneridge Campus. Apple acquired the campus from HP in 2010, which fortunately happened to be adjacent to other land the company had been secretly buying up, one parcel at a time, in order to assemble a contiguous lot large enough to support a second campus. The acquired HP plot was so large that it allowed Apple to consolidate its Campus 2 plans north of the freeway; Apple owns land on both sides of the six lane 280 interstate highway. 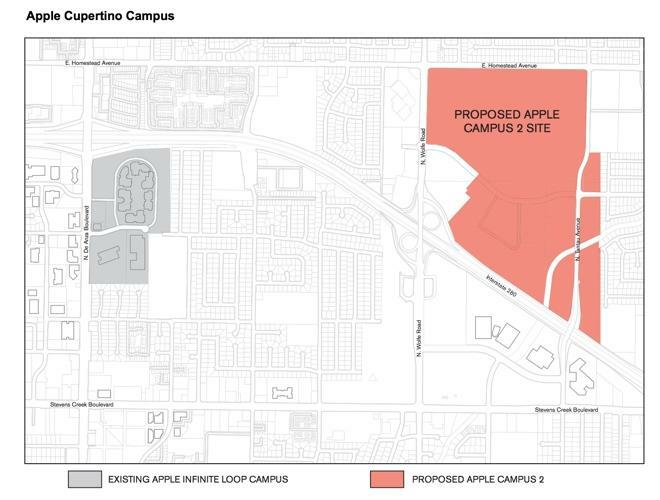 The Campus 2 plot is also quite close to Apple's existing Infinite Loop headquarters, located about one mile west at the next freeway interchange. 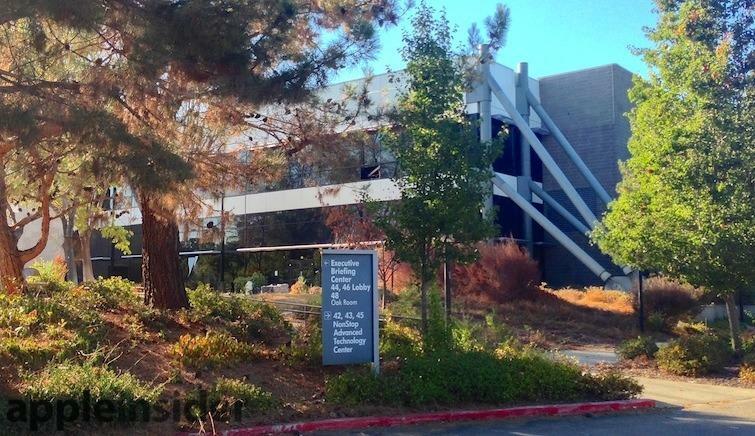 While Apple occupies a series of other buildings on land adjacent to the HP Pruneridge complex, the nine large HP buildings do not appear to have ever been occupied by Apple employees. Among them are the N42-N45 buildings above (seen looking west from Tantau Avenue), which once served as HP's NonStop Advanced Technology Center. The technology has now stopped. Scrap piles of steel studs sit below the busted out windows they exited the building from as the interiors of the buildings are stripped of recyclables. The back west side of the same building (below) has an identical pile, indicating entire floors have been gutted. Most of the HP land is covered by sprawling parking lots, like this one (below) on the north side of the complex as viewed from Homestead Road. Heavier construction is occurring on the far west end of the HP lots (below), where trucks are digging up chunks of concrete. The Executive Briefing Center building, facing the south side of the complex along Pruneridge, has 2x4s sticking out its upper windows. Apple does occupy a series of existing buildings on surrounding land, including four buildings on Valco Parkway, eight along Tantau, and portions of a circle of five buildings just south of HP on Ridgeview Court. Some of the buildings remain vacant, including a shuttered former credit union on the corner of Tantau and Pruneridge. Nearly all of the buildings are slated for destruction, but the HP complex (targeted in the center of the ring of the new Apple Campus 2 "spaceship" building) will likely be the first to go. "We plan to bulldoze all the buildings on the new site," Apple's chief executive Tim Cook said in February. The company will then "build one 2.8 million square foot building that will be the most collaborative work environment." He added, "I project that we will move in in 2016." Other surrounding, currently occupied buildings will apparently continue to be used until a second stage of construction begins along Tantau. In 2006, Steve Jobs addressed the Cupertino city council, saying that Apple's employees were spread around "thirty other buildings now and they keep getting further and further away from the campus." He added, "We've rented every scrap of building we could find in Cupertino." Jobs revealed at the time that Apple had quietly bought up nine separate nearby parcels of land to make up a new 50 acre campus, and intended to build a new complex capable of housing 3,000 to 3,500 employees. In 2010, the company lucked out when HP decided to sell the Pruneridge Campus, providing Apple with a combined 148 acre plot capable of accommodating a huge new campus. Toward the end of that year, Apple's head of Public Relations Steve Dowling said, "we now occupy 57 buildings in Cupertino and our campus is bursting at the seams. These offices will give us more space for our employees as we continue to grow." Earlier this year, Cook said the Campus 2 site currently has nearly 2.7 million square feet of office space spread around it, and that 80 percent of the land is covered by parking lots. 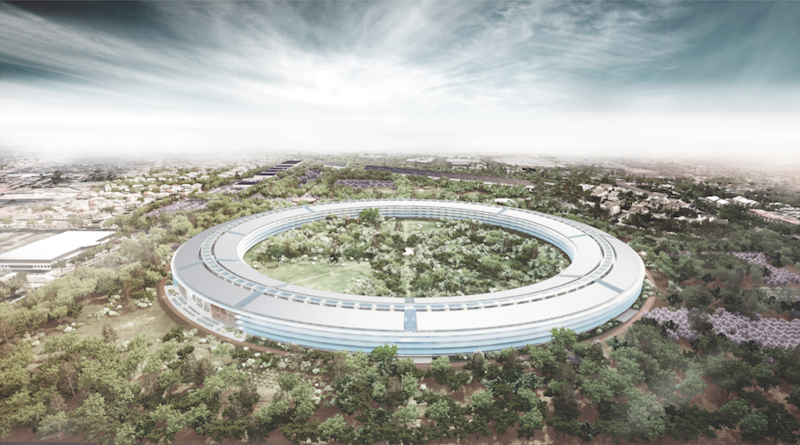 Apple plans to bulldoze the existing buildings and construct a primary, four-story circular building with roughly three times the size of its current main campus on Infinite Loop. After the project is finished, paved parking will cover only 20 percent of the land, thanks to underground parking and a separate parking structure. In addition, Cook said that the company has plans to expand its existing shuttle bus service to enable around 30 percent of the roughly 12,000 employees working at the new site to get to work without driving at all. 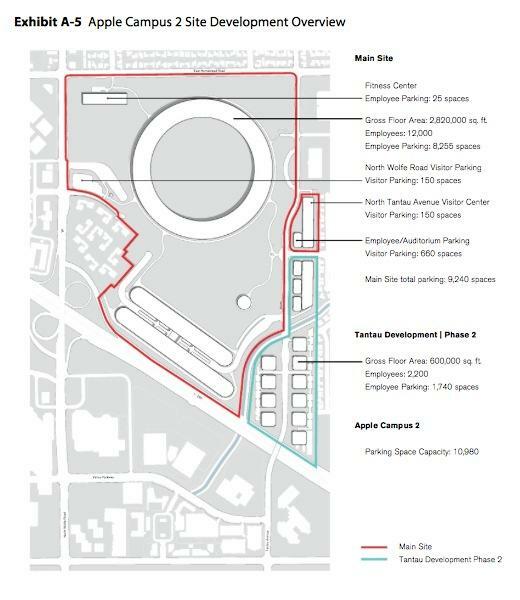 This reduction in required parking will contribute toward Apple's plans to replace the existing vast areas of asphalt with trees and green open space, including orchards of apricots that pay homage to the original agricultural use of land.